Thousands of dinosaur footprints have been found on a steep mountain slope in Denali National Park in Alaska. These are not the first dinosaur tracks to be found in Denali but the size of the tracksite – at least 500 by 150 feet – and the exceptional preservation of the tracks makes this a notable find. Of the thousands of tracks at this site, most are of hadrosaurs also know as duck-billed dinosaurs. There are also other avian therapod tracks and numerous plant and insect impressions. Another fascinating aspect of this fossil trackway is that it represents hadrosaurs of all sizes and thus must represent baby hadrosaurs to full-sized adults. There is evidence that suggests that most of the hadrosaur tracks were produced all at the same time. Putting these two observations together the authors conclude that these tracks represent the action of a multi-generational herd of hadrosaurs. In other words, this site is evidence that hadrosaurs moved around in large groups that included all family members suggesting at least some care for the young such as protection from predation. Because of the large number of prints found another hypotheses about hadrosaur life history could be tested. It had been previously suggested that large dinosaur species such as these hadrosaurs must have undergone very fast growth rates as juveniles. This would allow them to reach large sizes very quickly reducing their vulnerability to predation. But how can we ever know about the growth rate of an extinct animal? These preserved footprints provide one way of testing those growth rates without ever observing the dinosaurs directly. 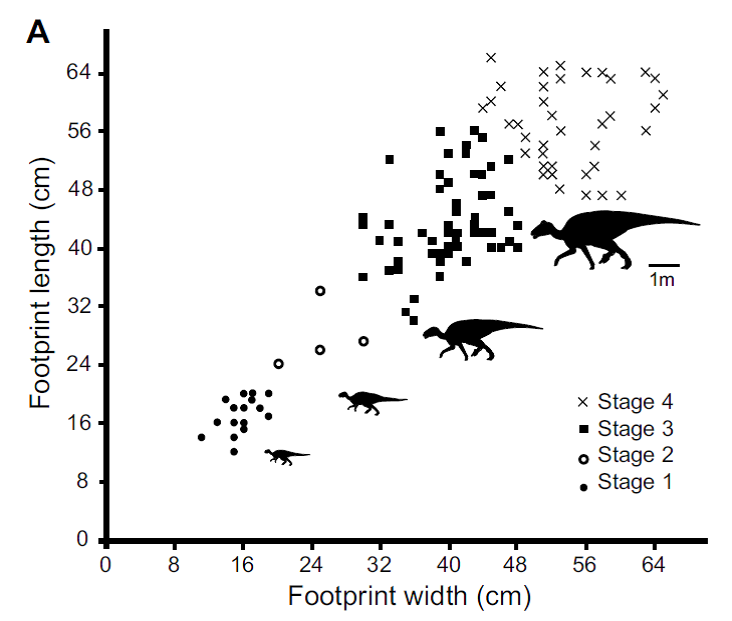 Figure showing 127 measured hadrosaur footprints from the Denali site in Alaska. This figure if from Fiorillo et al. Geology 2014. Check out the figure from the paper to the right. Here you see the results of measurements of 127 well-preserved hadrosaur tracks. Footprint length and width are very good indicators of overall size of an animal based on studies of a wide variety of animals alive today including humans. 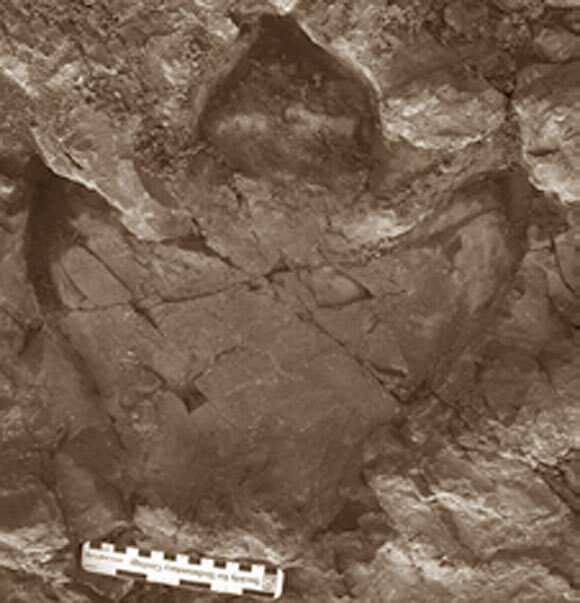 The footprints suggest four size classes of hadrosaur including something equivalent to very young, juvenile, young adult and fully mature animals. What is evident is that there are few juvenile tracks – only 3% – present compared to the others. The authors interpreted this as evidence that hadrosaurs likely grew very quickly resulting in few hadrosaurs being in a size class between very small and quite large. I told this story many times (Juvenile Dinosaurs Found Huddling in a Nest; Pregnant Stressed Dinosaurs and the Flood), but here we see what seem to be daily reports of findings that are easily accommodated by a deep time perspective of earth’s history and make no sense within a constricted young earth viewpoint. How do creationists explain thousands of tracks preserved in layers of rock they propose were laid down rapidly during a catastrophic global flood just 4350 years ago? They have suggested that dinosaurs were able to swim and run to avoid the first catastrophic waves of the flood and then found sand bars that appeared very briefly in various places as waves of destruction circled the globe. Dinosaur nests and the need for pregnant dinosaurs is a daunting problem but here we see a trackway that introduces even more problems than the usual dino tracks found on all continents. These tracks are found on top of 10s of thousands of feet of proposed global flood deposits. So the dinosaurs had to have survive somehow and somewhere while billions of tons of sediments was being laid beneath their feet. They they made their way across these sediments only to have hundreds or thousands of feet of additional sediments deposited on top of them. The problem presented by these particular tracks is that they don’t represent a few scared dinosaurs running for their lives or having dino-paddled for days before finding this sand bar. These tracks represent an intact herd of dinosaurs with babies to full-grown adults. On top of all that there are other dinosaur tracks at this same site but no mammals of any kind. How come dinosaurs were so adept at escaping flood waters and clinging to tiny remnant pieces of land and yet deer, canines, horses, elephants, camels, hippos, etc. are never found walking the same bits of muddy shoreline? How could a whole dinosaur family stay intact for weeks or months of the most cataclysmic event in earth’s history? The vast amount of sediments underneath their feet across all of Alaska would have to have been deposited before they plodded across this location. Where were they handing out while this sediment was being deposited and how did this baby dinosaurs keep up with their parents who were either swimming or running from one disaster to another? Rather than experiencing a chaotic recent flood fate, these dinosaurs appear to have been living normal lives. The other dinosaur prints, plants and insect fossils found in the same rock attests to a community of organisms that we have come to expect to be with dinosaurs. There is nothing here to suggest that these tracks were deposited in the midst of a global catastrophe. One further observation can be made about the results of the investigation of this dinosaur trackway. I have discussed the false dichotomy raised by creationists of so-called operational science vs historical science or what they call “origins science” before (Origins Science and Misconceptions of Historical Science, and Historical Science and the Case of T. Rex’s Puny Arms). Ken Ham would ask if we were there to see the dinosaurs make these footprints as if our lack of observations with our eyes prevents us from having any knowledge of what happened. The example above demonstrates that we can generate hypotheses about past events and test them using observations from the fossil record. We are further able to test these ideas by examining living things to develop expectations regarding the size of an animal based on the size of its footprints. No one was there to observe a herd of dinosaurs walk over a muddy region of a stream delta long ago. But that doesn’t mean that we can’t have great confidence that a group of dinosaurs did exist, did walk on this mud, and did come in different sizes. Excellent post. Thus far, you are the only one reporting on this I have seen that included the graph of the footprint size. Thank you for doing so. Looking at the data represented, I can’t help but wonder how likely their stages would hold up under a statistical analysis. I can see why they selected the boundaries for the most part and one would expect some overlap between them. Still, it would be interesting to see an analysis that examined just how distinct these stages are from their neighboring stages. Did they include anything like that in the paper? Thanks. They have some simple stats that support their age classes. The figure I included is just a portion of a larger figure. The link at the bottom of the post should take you to the open access article where you can see the graph better. I thought about suggesting an alternative hypothesis in my post. Since there my be discrete sets of size classes and they likely represent age classes this set of prints could just be the result of a bad breeding season the year before or there is a high rate of mortality after the first year. I agree the lack of medium sized hadrosaurs could be due to really fast growth through that size class but I think that 5 or more similar tracksites will have to be found to have a better statistical tests to distinguish these hypotheses. Still a pretty cool find. I confess that I saw which journal it was and, based on my past experience with them, had assumed it was behind a paywall with only the abstract available. Thank you for posting a link to the full article. Now after reading the article, they do indeed answer my question, discussing results of a cluster analysis for statistical relevance of the groups. You raise very good points. High mortality rates among the younger cohorts I would say is likely and would be expected in a migrating herd. A bad breeding season is also very plausible. None of the hypotheses are mutually exclusive of course, but distinguishing the relative importance will be tough and will require more tracksites, as you stated. None of the other hadrosaur trackways I have seen are amenable for adequate comparisons though, unfortunately. That is the same way I feel about Geology. Great journal but that paywall is really frustrating especially given I have access to almost everything else. I usually don’t even bother trying to look but just happened to notice this one was OA. It’s all about studying trackways and other trace fossils and what can be learned from them. Although written on a popular level, it does get into quite a bit of detail, and shows how carefully all the hypotheses are considered before drawing firm conclusions. There’s even a drawing proposing what kind of trace a dinosaur vomiting from a great height would produce! Dino vomit, now that is something I hadn’t ever contemplated before! That book looks really interesting. I’ve added it to my Amazon cart for purchase at some point.